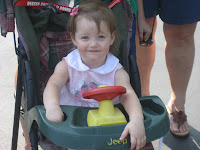 We spent our Labor Day at Six Flags! We met Grandma Wentz at a gas station nearby and went on our way! 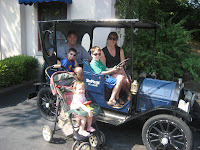 Here's our family picture in the antique car. Then we wanted a funny picture. 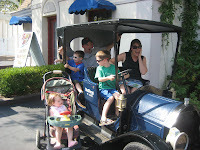 Does it look to you like our kids are like, "Let's get out of this car and away from our embarrassing parents!!!"? 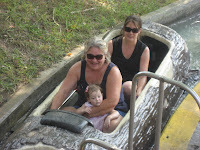 Mikalya looks like she's thoroughly enjoying the log flume. 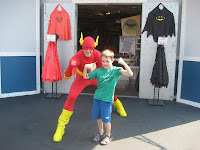 I had forgotten that Six Flags was Super Hero heaven. We saw The Flash, and Batman, along with Scooby Doo, Shaggy, and the Looney Toons. Logan was so awestruck when we saw batman that he wouldn't even get close to him! I asked Logan, "How'd you feel when we saw Batman?" He said, "Kind of shy." "Why?" I asked "Cause I just never saw a REAL Batman!"